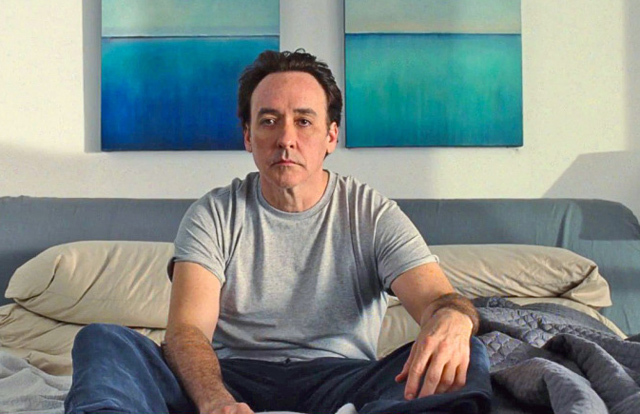 CHICAGO – John Cusack has never rested on his laurels, which are many in his film career, nor stood still as an artist or an actor. His latest film is the magnificent “Love & Mercy,” in which he portrays music legend Brian Wilson of The Beach Boys as a middle aged man, trying to break free of the circumstances in his life. Written by Oren Moverman and Michael Alan Lerner, and directed by Bill Pohlad, “Love & Mercy” – derived from a Brian Wilson song title – is the story of two crucial phases in the songwriter’s life. The younger phase, portrayed by Paul Dano, checks in with Wilson as he puts together The Beach Boys’ album masterpiece, “Pet Sounds.” At this point, the dissolution of Brian Wilson as Rock Star is beginning, and as a result the older phase of his life comes into view. And it is John Cusack who takes over that phase – the film spectacularly cuts back and forth between the two stories, lending a perspective about one of the most mysterious composers and song artists in popular music history. Cusack’s performance is free of distracting attempts to look like Wilson, and full of an essence regarding the man’s inner being. It is a characteristic and instinctive performance, especially when Cusack-as-Wilson challenges the conventions of his therapist keeper, Eugene Landy (portrayed with equal verve by Paul Giamatti). It is one of John Cusack’s finest portrayals. Cusack can lay claim to Chicago area roots, having been born in Evanston, Illinois, the first northern suburb outside the city. He graduated from Evanston Township High School, where he attended with fellow actor Jeremy Piven. He dropped out of college after one year to pursue acting, and made his debut in the 1983 film, “Class.” What followed was a string of hits, including “The Sure Thing” (1985), “Stand by Me” (1986), “Eight Men Out” (1988), and the film that defined his early career, the classic “Say Anything…” (1989). Cusack made a successful transition into adult roles, working for a string of name directors including Stephen Frears (“The Grifters,” “High Fidelity”), Woody Allen (“Shadows and Fog,” “Bullets Over Broadway”), Robert Altman (“The Player”), Terrence Malick (“The Thin Red Line”), Spike Jonze (“Being John Malkovich”) and Lee Daniels (“The Butler”). He has chosen projects from all over the modern film spectrum, and has gone through every transition of life with the same passion toward his art. HollywoodChicago.com interviewed John Cusack and Brian Wilson together (click here for Mr. Wilson’s part of that interview, where Cusack graciously added some questions) at the Music Box Theatre in Chicago, and got several amazing insights to the actor’s commitment to honoring a music legend, and his friend. HollywoodChicago.com: Which Beach Boys or Brian Wilson album did you use to best get a sense of his character in the time period in which you were portraying him, and which specific song kept ringing within your characterization? HollywoodChicago.com: What did you and Paul Dano talk about, or strategize about, in regard to making the connection between the two Brians? Cusack: We didn’t really talk that much – and that wasn’t designed or handed down by edict – and we both wanted to get our own feeling of Brian. We didn’t want to compare notes. The way I approached that time in Brian’s life was by feeling, and sensitivity. That’s the way we both went about it – lead with the heart, and then go. HollywoodChicago.com: How do you think the pressures of your own life in show business was brought to bear in your portrayal of Brian. What did you most know about the type of celebrity that Brian has, and you share? Cusack: Speaking just for myself, when I hear Brian’s music I hear an artist that is totally unformatted. Even though he is rigorous in his disciplines, he doesn’t have any limits to where his imagination and ear can take him. There is always a struggle when people want you to do what you did before, because it sells. When I was younger, they kept saying to me ‘you’ve done something good, so keep doing it.’ As an actor, I wanted to keep exploring. I think every artist can relate to Brian’s struggle to keep creating, and to be true to himself. That is not the easiest thing in the world when people want hits. So the idea, for example, that Brian did ‘Pet Sounds’ and the ‘Smile’ sessions while the pressure was for him to do what he’d already done, and every artist would think, ‘my god, don’t they realize what he was trying to do?’ We’re all not geniuses like Brian, but every artist relates to that struggle between commerce and spiritual creativity. HollywoodChicago.com: You eschewed make-up to look like Brian in the film, as you did playing the young Richard Nixon in ‘The Butler.’ How do you resist the temptation to ‘hide behind make-up’ when portraying a real person? Cusack: Actually, in ‘The Butler’ I did wear a prosthetic Nixon nose. [laughs] Generally I won’t do that, and I didn’t do it in ‘Love & Mercy.’ As I said, I was portraying Brian during a difficult time, and I didn’t want to be too glamorous, even though Brian is a very handsome man. I don’t want to get trapped in my vanity or ego, I wanted to lay it all out. I don’t have any set rules about the use of make-up, it depends on what I’m doing, and what feeling I want to give off. HollywoodChicago.com: What was the process of working with Paul Giamatti as Eugene Landy, given that you had many hard scenes between your character of Brian and his character of Landy? Cusack: We rehearsed it a bit, but really it was about the gracious opening up of Brian and Melinda, inviting me to their home so I could understand how things worked for him, so I could be as accurate as possible. Brian’s close family and friends, and the people that were with him for years, they were the people I really wanted to make sure I was doing it accurately for – they were the critics for me. If we captured a bit of the maestro, then I am lucky. I was happy to also spend some time with Melinda and a close house employee of Brian’s that had been with him for years. I was able to ask questions about who Eugene Landy was, and I did ask Brian as well, but I didn’t want to bother him too much. He was very gracious to talk to me about it. HollywoodChicago.com: Previous to this film, which director and film in your career have you most connected to, as far as the philosophy of your performance and the results of that connection? Cusack: I’ve been lucky enough to work for so many greats. Woody Allen is a great director to work for because he watches, and then walks away. He is just listening to hear if the scene is in tune, if it’s in rhythm. He’s listening to the dialogue, and how it sounds. Stephen Frears, who I collaborated on in ‘High Fidelity’ when I was younger, had a vibe of giving the actors space to make mistakes, and you had to be a little bit dangerous emotionally, you had to get vulnerable. He was very sensitive to actors, but was very rigorous intellectually, and a great artist. I learned a lot from Stephen. HollywoodChicago.com: How about Bill Pohlad, your collaborator on ‘Love & Mercy’? Cusack: He is in that tradition, and has produced enough terrific films, and understands the artistic process. Sometimes you can come on, and nail things right away, and sometimes you have to get in the groove and work your way into it. He was very sophisticated, in that sense. HollywoodChicago.com: Since we are guys of a certain generation, and we absorbed all his music in our youth, how did you want to honor Brian Wilson the most, in portraying one of the greatest creators in popular music history? Cusack: First I would say that all his music is part of our DNA now. It’s not that we take it for granted, but we did grow up on it – it is a celestial choir that came out of Brian and the people that he worked with, and I honor the creativity and spirit of it. I think the portrait is of a great artist – and a loving, humble and beautiful man – and now I’m fortunate enough to say I’m a friend. That is one of the great honors of my life.